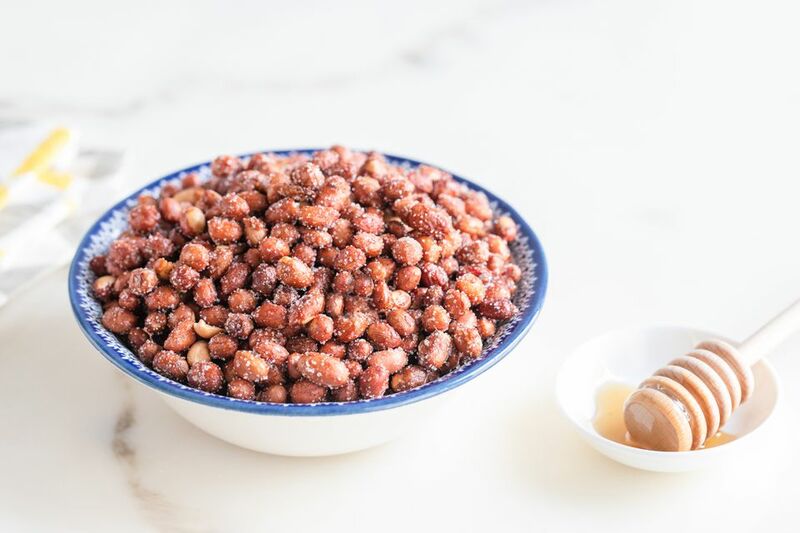 After trying this recipe for homemade honey roasted peanuts, you'll never buy them from the store again! These crunchy honey roasted nuts have a deep honey flavor with just the right amount of salt. Place the butter, honey, vanilla, cinnamon, and 1 teaspoon salt in a large microwave-safe bowl and microwave until the butter is melted, about 45 seconds, stirring halfway through. Once melted, stir until the liquid is smooth. Add the peanuts to the honey mixture and stir until they're all coated. Pour the peanuts out onto the prepared baking sheet and spread them into an even layer. Bake the peanuts for a total of 20 minutes, stirring every 5 minutes to prevent burning. The peanuts at the edges will brown faster, so it's important to stir regularly to get an even roasting. Once the peanuts are golden brown, remove them from the oven and stir again to distribute the honey on the baking sheet. After a minute or two, sprinkle the granulated sugar and remaining 1 teaspoon of salt on top and stir again, to give them a bit of texture. As they cool at room temperature, stir occasionally, to break up any big clumps. Once the peanuts have cooled completely, place them in an airtight container or plastic bag and store them at room temperature. It's best to use raw nuts in this recipe, but if you can't find raw peanuts, use nuts with as little processing and salt as you can find. Try experimenting with adding other spices, like cayenne or chipotle powder, to make spicy honey-roasted peanuts.